Anyone who has lived through a tornado will tell you that these are the most terrifyingly beautiful things on Earth. 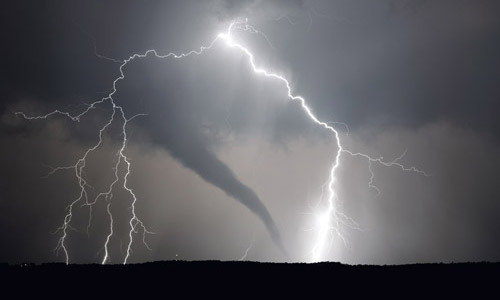 The amount of power that a tornado wields is equal parts impressive, mesmerizing, and horrifying. We all love witnessing their raw power through the images and videos captured by storm chasers, and we wait with bated breath to see the cost of their passing. The amount of devastation that just one tornado can cause is hard to comprehend. Since these beasts are so deadly and destructive, we have put an uncharacteristic amount of time and effort into understanding them. A tornado-forming storm forms like any other thunderstorm. Typically, storms form when warm, moist air is trapped under a blanket of colder and dryer air. Cold air naturally wants to sink, and warm air naturally wants to rise. This destabilizes the atmosphere. Eventually, the cold air will fall off to the sides of the rising column of warm air. The rising warm air spreads into a larger volume, which causes the air to cool. It will then cool to the point that the moisture in the air reaches the condensation point and forms tiny droplets of water. The reaction for the moisture, which is water in its gas form, to turn into liquid water releases heat. That release of heat is called “latent heat” and causes the rising column of air to rise ever higher, which condenses more moisture into water droplets, over and over again. Depending on the atmospheric conditions, a typical storm cloud could rise anywhere from 6 to 9 miles (or 10 to 15 kilometers) above the ground. As the warm air rises, more air has to take the place where that pocket of air once was. It’s kind of like a vacuum effect, pulling in more warm air from all around the rising storm and up into the cloud. This is called an updraft. As it gets pulled up into the cloud, the updraft starts traveling faster and faster. This means that near the surface, the wind may be blowing something like 5 miles per hour, but higher up, it may be blowing something like 25 miles per hour. 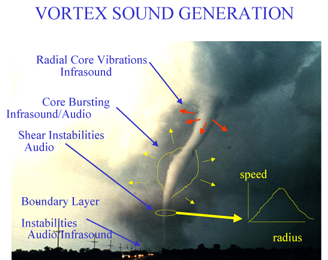 This creates wind shear and starts a rotating column of air spinning horizontally, parallel with the ground. Not very tornado-like, but if the wind is spinning hard enough for a tornado to form and if it gets forced up in the updraft, the spinning column of air will spin like a top inside the cloud. This is the next crucial point. If the balance between the twisting motion and the instability release in the atmosphere is just right, a tornado will start to form. The twisting column of air will extend down, and if it’s lucky it will touch the ground, then we will have a new born tornado. What makes a tornado so deadly is the concentration of the spinning winds. The violently twisting winds rip things apart, they take reinforced steel supporting beams and crush and twist them like they were the twist ties on your bread loaves. Even the weakest tornadoes, an Enhanced Fujita scale 0, have quite a punch to them, spinning at a minimum of 65 miles per hour. The strongest, an EF5, spinning faster than 200 miles per hour would rip houses apart like they weren’t even there and completely remove their foundation. It would send people flying for several thousand feet like they were rag dolls. Whatever the tornado destroys doesn’t simply just go away, it gets sucked up into the tornado, spinning around it to be used like missiles to be flung for miles, impaling buildings and animals miles away. The winds aren’t the only dangerous thing about a tornado. You also have to think about the size of the tornado. Most tornadoes are a hundred yards across, maybe smaller. But the big ones, the deadly ones you only ever read about, can be a mile or more wide. One tornado that hit Oklahoma has been reported at 2.5 miles wide. When you take the width of the tornado, and its wind speed, tornadoes are one of (if not the most) deadly natural event on the planet. But us, being humans, we like to measure things. 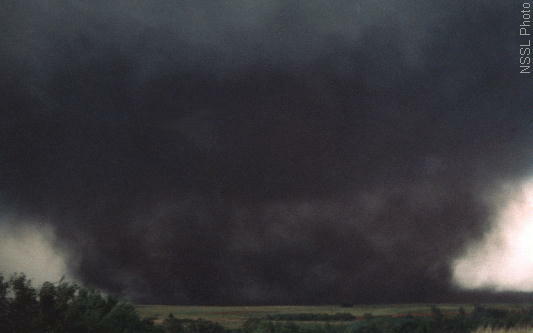 The Enhanced Fujita Scale, or the EF scale, is a measure of a tornado’s wind speed estimated from the damage it does to the buildings around it and in its path. It is broken into six categories, going from an EF0 to an EF5. The tornado earlier this week in Oklahoma is currently estimated at an EF4+ at the time of writing this article, meaning it is definitely an EF4 but could be upgraded soon to an EF5, a once in a lifetime tornado. EF5s are VERY rare because to create one that strong, the storm that created it has to hit the jackpot of conditions. So rare, they only come around once during an average lifetime.